9:09 AM - Good morning. 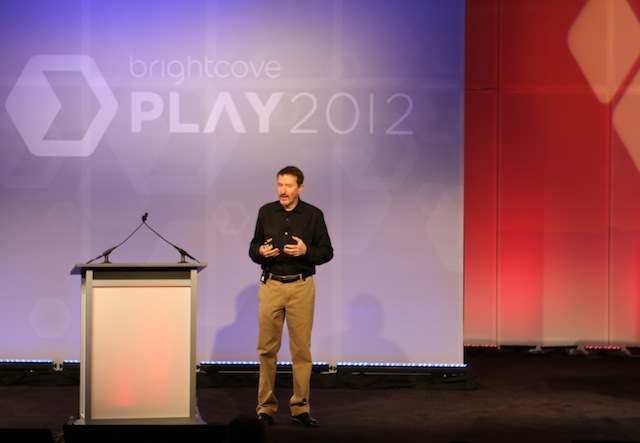 We're blogging live from the PLAY Day 2 Innovation Keynote. Brightcove President and COO David Mendels is on stage delivering a recap on the numerous Video Cloud product developments that have taken place over the last year. 9:12 - Brightcove has done a lot of work to ensure that our Video Cloud Smart Players work across all devices, shielding you from the complexities of device and operating system fragmentation. 9:14 - We’ve introduced numerous APIs in our HTML5 player that leverage the abstraction layer: subtitle, seek, and overlay are just a few of the more popular APIs introduced to date. This is also letting you build your own UIs, applications, and specialized integration. 9:16 - We’ve been working relentlessly to improve playback quality. Within a week of implementing the new algorithm back in December, the average bitrate across the video cloud service improved from 600 kbps to 1 megabits per second. 9:19 - Since PLAY last year, we’ve released Adobe Access into general availability for Video Cloud. The work we did here is helping to meet the demands of everything from some of the world’s largest banks to major motion picture studios. Adobe Access is avaialble today as an option for every Brightcove Premium customer. 9:21 - We’ve also introduced Apple HLS encryption, the only native iOS-supported encryption format for delivering live on-demand video to iPad, iPhone, iPod Touch, as well as Apple TV. 9:24 - We’ve done a lot to increase your efficiency and productivity. New Video Cloud updates to the Studio user interface give you the ability to replace a video or re-transcode a video without losing any of the analytics or re-entering metadata. You can create and edit remote assets using your same remote assets in the UI. 9:26 - Other new Video Cloud features include advanced search and live chat (which will be rolled out gradually). 9:28 - Moving on to upcoming product developments. The amount of content we’re processing has increased by 350% since last year. We’re going to roll out a new upload and transcoding platform. Includes parallel processing that creates renditions in parallel, giving us the ability to ingest faster and produce all renditions at the same time. 9:34 - Brightcove is the only online video platform that's a Google Widevine Cerfitified integration partner, giving users the ability to deliver Widevine protected content to hundreds of millions of devices. 9:38 - New HTML5 advertising partners. 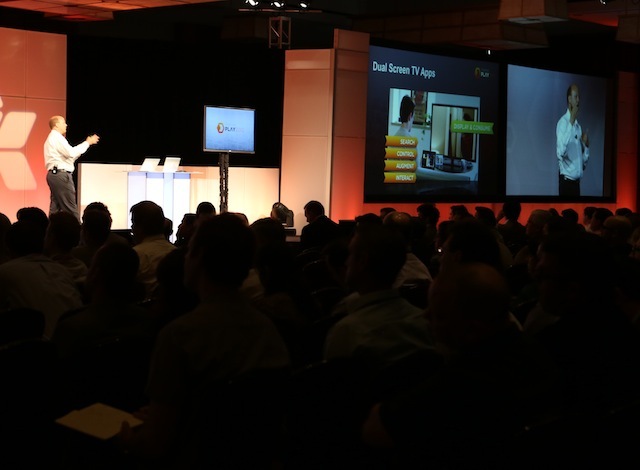 We announced DoubleClick last year. Now we have Tremor, LiveRail, SAS and Sticky Ads TV. And there are more to come. 9:39 - We’ll be introducing a new real-time analytics platform that’s using big data technology and is built for truly massive scale. The ability to process 60 GB of data a day in real time and collecting 20,000 events per second. 9:41 - New analytics platform designed to increase your efficiency, provide real-time insights, offer better understanding of your performance, and it’s available on any device since it was built using HTML. 9:43 - New analytics platform will feature an analytics APIs for users to build out their own UIs, integrations and mashups. 9:47 - Jeremy Allaire take stage to discuss App Cloud developments. 9:49 - We built App Cloud with three things in mind. A hybrid app development model, cloud based infrastructure and cloud based business services. App Cloud is being deployed across industries, scenarios and regions. 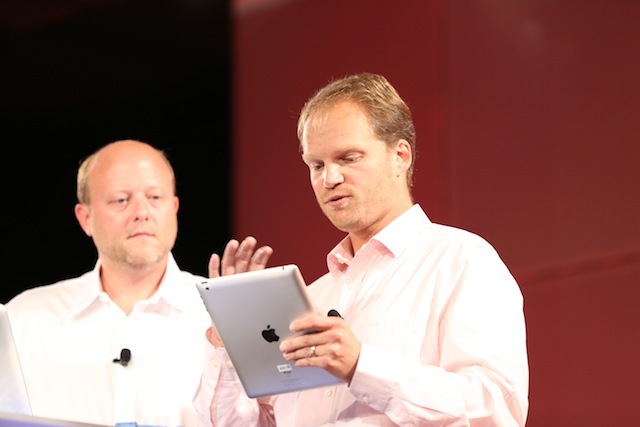 9:52 - Demo of the AMC mobile app built with App Cloud. Include video clips and some full episodes, images, blogs, schedule information, episode summaries, and social media for several of AMCs top TV shows. 9:55 - Other App Cloud examples include apps from NBC Universal, Fox Business Channel, United States State Dept., Joyce Meyer Ministries, Met Opera on Demand. 9:59 - How does the app economy grow from 500,000 apps to 50 million apps? It’s not that far fetched. Look at the growth of the Web. We think there will be a similar phenomenon with apps. Announcing App Cloud Core. 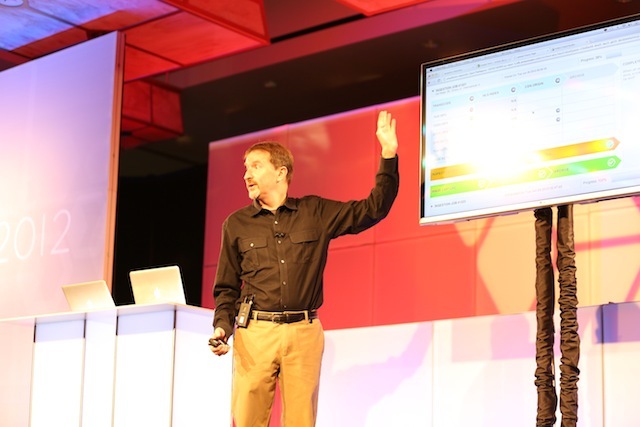 Takes App Cloud’s essential technologies and makes them available for free. Free platform for creating rich, cross-platform apps. The whole platform is open. We believe there are millions of web developers who should be unleashed into the app economy and we want to help them do that. App Cloud principal architect Ashley Strebb takes the stage. 10:03 - Ashley demos a new app created by Analog Devices. 10:11 - In-depth demo of App Cloud Workshop’s ability to help developers easily build, test, and collaborate on app development process. 10:14 - A special feature of App Cloud is the use of smart content sources to intelligently cache, optimize, and compress content so it loads faster on mobile apps. 10:18 - Also announcing App Cloud Pro and App Cloud Enterprise. Pro: Starts at $99 a month for up to 10,000 app sessions per month. Enterprise: Available with annual contracts. For larger organizations that are operating at significant scale or that need access to the most advanced App Cloud functionality available. 10:27 - App Cloud is the only end to end platform for apps in the market today. 10:28 - Dual screen apps for Apple TV really change the model for developing and delivering rich TV experiences. Virtually every app on a phone or tablet has the potential to have a natural extension onto a TV screen. TV is no longer just TV. It’s a programmable display service. This is paving the way to new monetization models and opportunities. The living room just got on the app innovation power curve.